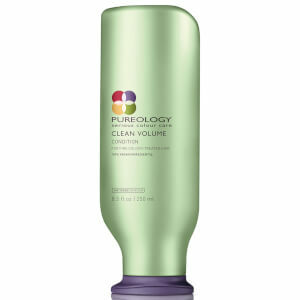 Pureology's Clean Volume Colour Care Duo has been carefully curated to help liven up limp, lack-lustre locks. The shampoo and conditioner work in synergy to add body and bounce to lifeless tresses. Suitable for fine, colour-treated hair. 100% vegan. 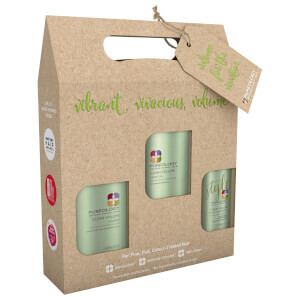 Free from sulphates, silicones and parabens. 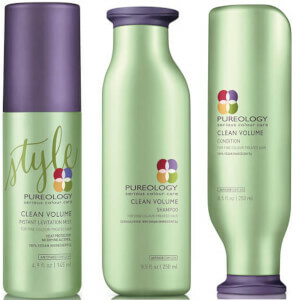 A ZEROSULFATE®, body-building shampoo that adds weightless volume to limp, lifeless locks. Gently cleansing away dirt and impurities, the volumising shampoo eliminates grime and build-up while promoting airy, full-bodied appearance. The shampoo utilises Aloe Water, which adds fullness to hair, absorbs oils and retains moisture, while Wheat Protein and an ANTIFADE COMPLEX® fortifies, adds lustre and protects to leave your colour-treated hair vibrant and vivid for longer. 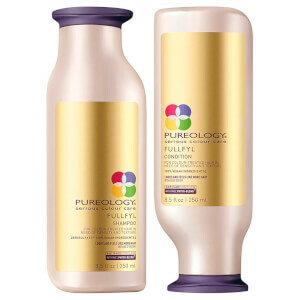 A lightweight conditioner that detangles and volumises without weighing hair down. The ZEROSULFATE® formula expertly softens and smoothens tresses while promoting enviable shine, flexibility and body. It contains moisture-retaining Aloe Water to hydrate while eliminating oil, and fortifying Wheat Protein to protect and strengthen every strand. It also utilises an AntiFadeComplex® and provides UVA/UVB protection to inhibit colour fading. Your hair looks silky and full-bodied with prolonged vibrancy. Infused with a Musk, Amber, Peach and Jasmine fragrance. Shampoo: Aqua / Water / Eau, Decyl Glucoside, Cocamidopropyl Betaine, Sodium Cocoyl Isethionate, Cocamide Mipa, Sodium Chloride, Peg-55 Propylene Glycol Oleate, Propylene Glycol, Glycerin, Parfum / Fragrance, Sodium Benzoate, Brassicamidopropyl Dimethylamine, Hydrogenated Coconut Acid, Salicylic Acid, Sodium Isethionate, Tocopheryl Acetate, Hydrolyzed Soy Protein, Aloe Barbadensis Leaf Juice, Butylene Glycol, Benzyl Alcohol, Benzyl Salicylate, Linalool, Helianthus Annuus Seed Extract / Sunflower Seed Extract, Coumarin, Ethylhexyl, Methoxycinnamate, Citronellol, Citric Acid, Potassium Sorbate, BHT, Sodium Hydroxide. Conditioner: Aqua / Water / Eau, Cetearyl Alcohol, Brassicamidopropyl Dimethylamine, Parfum / Fragrance, Sclerotium Gum, Tartaric Acid, Caprylyl Glycol, Salicylic Acid, Glyceryl Stearate, Kaolin, Tocopheryl Acetate, Hydrolyzed Soy Protein, Ethylhexyl Methoxycinnamate, Aloe Barbadensis Leaf Juice, Butylene Glycol, Benzyl Alcohol, Benzyl Salicylate, Linalool, Helianthus Annuus Seed Extract / Sunflower Seed Extract, Coumarin, Citronellol, Citric Acid, BHT, Potassium Sorbate, Sodium Benzoate.